The first high-altitude frozen mummy found in Chile was located and then hidden by looters who eventually sold it to the government. During the Inka Empire (1438–1533), individuals (usually children) were brought to remote high-altitude locations and ritually sacrificed. Because of the extreme cold, their bodies were unintentionally mummified, preserving their skin, hair, soft tissue, clothing, and the ritual objects associated with them. 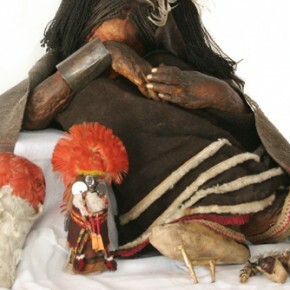 The bodies are linked to ‘capacocha‘, or human sacrifice as an offering associated with fertility (Reinhard and Ceruti 2010: 6). Capacocha occurred during important events, for example the death of the monarch, when stability and order were sought from the gods. Physically perfect children were selected for the ritual and taken via holy procession through the empire to a sacred mountain. They were fed coca leaves and maize beer (chicha) along the way and during the ceremony, presumably to keep them docile. They were then killed via strangulation or a blow to the head, or left to die of exposure. The remarkable state of preservation of these bodies allows for a detailed analysis of Inka life and death. It also attracts looters seeking rare textile and feather artefacts in near-perfect condition. In late January 1954, Guillermo Chacón Carrasco, Luis Gerardo Ríos Barrueto, and Jaime Ríos Abarca left the village of Puente Alto and climbed Cerro El Plomo, a mountain in the Chilean Andes. 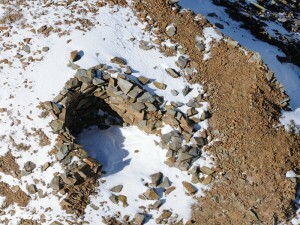 Chacón was a treasure hunter and looter of archaeological sites and the group’s intent was to dig at three ancient structures upon the mountain in search of artefacts to sell. Chacón had previously looted sites on the mountain and had found some ancient silver items (Museo Nacional de Historia Natural n.d.). The men dug in a number of spots on the mountain where they found gold and silver camelid figurines and several other ritual offerings. On 1 February, at an altitude of 5,400 metres, the group encountered the frozen body of an sacrificed Inka child (Mostny 1957: 11). The group deposited the body in a cave and returned to Puente Alto with only the associated artefacts and ritual objects (Museo Nacional de Historia Natural n.d.). Several weeks later the group decided to travel to Santiago in hopes of selling the objects in their possession. The Museo Histórico Nacional refused to see them, but Dr Grete Mostny, head of Anthropology from 1943 until 1964 at the Museo Nacional de Historia Natural, met with the men on 16 February (Fuenzalida 1957: 3). Mostny asked that the men return at the start of March when the museum director, Humberto Fuenzalida would be present. When the men returned on 17 March, Fuenzalida attempted to buy the ritual objects but a price could not be agreed upon (Fuenzalida 1957: 3; Museo Nacional de Historia Natural n.d.). Meanwhile, Mostny went to Puente Alto to search for the stashed mummy (Fuenzalida 1957: 3). In response, the looters removed the body from the cave on 8 March. This resulted in tense negotiations and, eventually, the looters were paid 45,000 pesos for the body (La Tercera de la Hora 1954; Museo Nacional de Historia Natural n.d.). 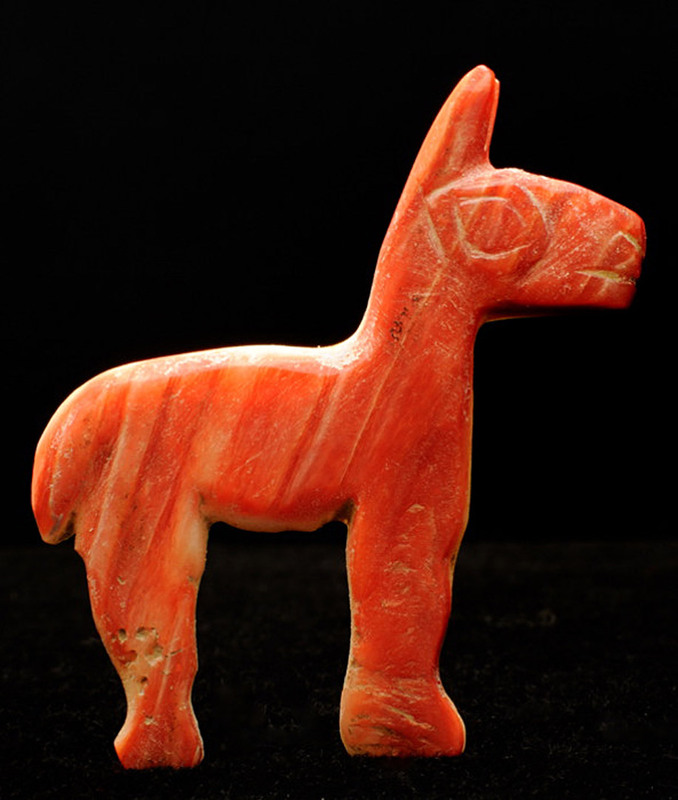 Spondylus llama found with the child; photo via the MNHN. The mummy was found to be that of a perfectly preserved Inka boy who died at the approximate age of 8. His hair had been styled into over 200 small braids tied with a cord. His face had been painted with red and ocher stripes. He was dressed as a high-status individual in a red wool shirt trimmed with white leather fringe, a red wool mantel, and leather embroidered moccasins. He wore a silver armband and a headdress of black wool topped with condor feathers. A bag with the body contained locks of his hair, his nail clippings, and his baby teeth. Based on his clothing, the boy is thought to have come from the part of the Inka Empire called the Qullasuyu which includes the Peru/Bolivia Altiplano and parts of northern Chile and Argentina. He is thought to have died from exposure after being placed in a rectangular sunken chamber atop the mountain (Museo Nacional de Historia Natural n.d.). The body is now kept in the Museo Nacional de Historia Natural and is considered their most valuable anthropological piece (Museo Nacional de Historia Natural n.d.). It is preserved in a special chamber with a humidity of between 42 and 45 per cent and a temperature between -2 and -4 degrees Celsius. The body is no longer on display at the museum in accordance with a UNESCO recommendation to not display human remains, but visitors may view a replica. Fuenzalida V., Humberto (1957) ‘Historia del Hallazgo’, La Momia del Cerro el Plomo. Boletin del Museo Nacional de Historia Natural, Tomo XXVII, No 1: 3–8. La Tercera de la Hora (1954) ‘La momia es cierto, yo la descubri: relató el campesino Luís G. Ríos’, La Tercera de la Hora, 30 March. Museo Nacional de Historia Natural (n.d.), ‘Niño del Cerro El Plomo: Historia de su Hallazgo’, Website of the Museo Nacional de Historia Natural. <http://www.mnhn.cl/Vistas_Publicas/publicContenido/ContenidoPublicDetalle.aspx?folio=5775> Accessed on 29 April 2014. Reinhard, Johan and Maria Constanza Ceruti (2010) Inca Rituals and Sacred Mountains (Los Angeles: Cotsen Institute of Archaeology Press).